I've let you know in a previous post all the good things that i think about Kevin Kidney and Jody Daily fantastic work. You know, Kevin and Jody are these two great sculptors who created the Disneyland 50th anniversary collectibles that were on sale on Disney Shopping two years ago. More recently, they've participated to the Tiki Room anniversary collectibles released last month - yes, the beautiful Tiki Fountain was designed by them. 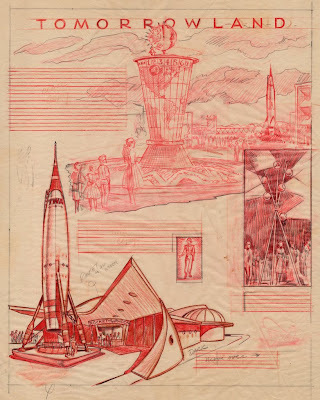 But Kevin have also his own Miehana blog, where he post regularly extremely rare and old Disneyland artwork like this original Tomorrowland pencil sketches "for a 1955 newspaper section presenting some of the "many delights and wonders that are yours to enjoy at Disneyland." 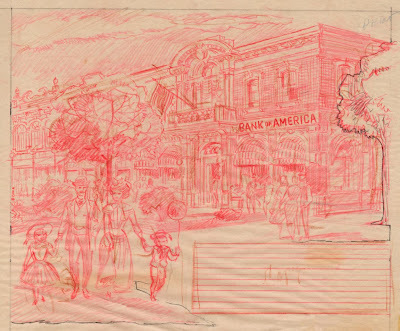 Or this one showing a Bank of America Main Street building "in an authentic, turn-of-the-century setting". And this great one of Disneyland Red Wagon Inn - one of the "charming eating places in Disneyland". Many of them are in full colours like this one showing Main Street old lamplighter - in fact you will even see the two versions - first the pencil sketch then the colour version. 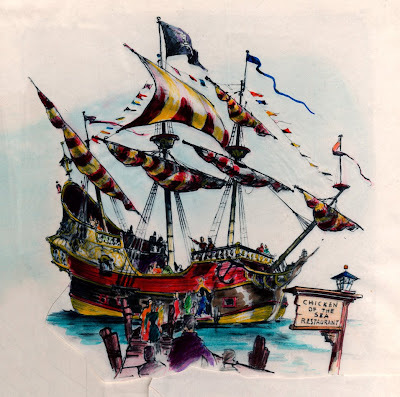 And also this great painting of Fantasyland galleon - Chicken to the sea restaurant. 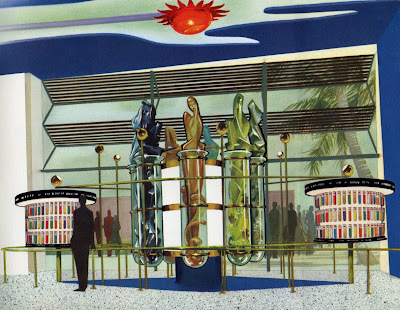 Most of you will discover these Chemitron exhibit which took place in Tomorrowland Monsanto's Hall of Chemistry attraction a loooong time ago! You see, there is literally dozens of never-seen-before artwork on Kevin's blog. 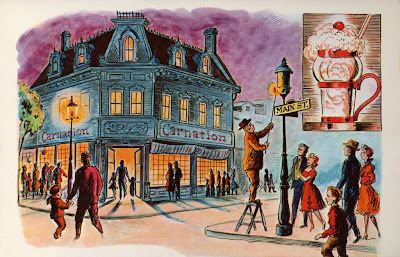 And i don't mention the fantastic piece of art that Kevin just post on his blog yesterday to celebrate Disneyland's 53rd anniversary...For all these good reasons, you should really rush to Kevin's Miehana blog and put it in your bookmarks as there is many more treasures to come! Artwork: copyright Disney - Many thanks to Kevin, and keep up the great work!